A cultivar of Camellia japonica L. The outer petals of ‘Anemoniflora Knightii’ are vivid red and heart-shaped, the inner petals small, intercolated, and striped with white. The flowers are usually double but occasionally single. [ICR]. 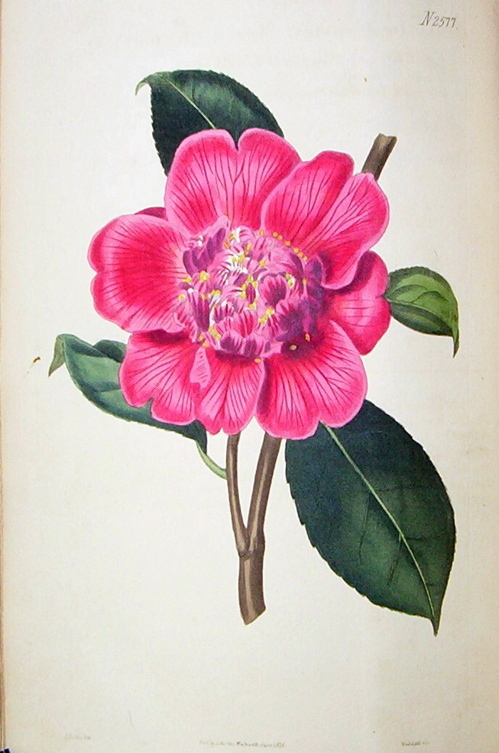 ‘This variety of Camellia japonica [‘Knight’s New Waratah’] was raised, by Mr. Joseph Knight, [c. 1822] from seeds procured from the Waratah, or Anemone-flowered variety, impregnated probably by the pollen of a semi-double variety, at the Exotic Nursery in the King’s Road. It differs from [anemoneflora] particularly in having fewer of the large petals, and in the central ones bearing some, more or less perfect, anthers.’ The centre of the flower is less regular than in the older cultivar. [BM t.2577/1825]. ‘It is free in flowering and the blossoms open at the usual season, early in the spring. It may be considered well deserving of cultivation.’ [LBC no.1463/1828]. Listed in the 1850 and 1857 catalogues [T.198/1850]. Desideratum to Loddiges’ Nursery, 6th January 1845 [MP A2933-2, p.28]. This is the probable source.